During Cecil Sharp's folk song collecting in Appalachians 1916 -1918 he was known to have experienced the most pleasantest of times whilst sitting on a verandah of a log cabin talking and listening to songs, experiencing a very satisfying feeling of musical exchange. ​​Earlier this year Amanda was awarded a grant from Arts Council England to support her collaboration with two renowned Appalachian musicians. Hammered Dulcimer musician, Dan Landrum and Mountain Dulcimer musician, Aaron O'Rourke. Dan and Aaron arrived a week prior to tutoring at Halsway Manor. They all stayed at a fantastic new centre for creative practice called Clayhill Arts near Bridgwater and worked on a selection of Appalachian and Somerset songs from Cecil Sharp's collection, sharing their outcomes with members of the public in Somerset communities. Three complete beginner MD workshops were delivered by Aaron. Dan and Aaron also performed with The Axbridge Singers during a joint concert May 2018, having arranged two pieces originally by Malcolm Dalglish. Although the Somerset and Appalachian singers from Sharp's era never met, Amanda likes to imagine that they are connected through the lineage of folk song and melody. The following recordings were made during playful rehearsals at Clayhill Arts, May 2018. Please click on the image of Clayhill Arts and visit their website. Their version of, 'The Green Bed,' First a verse given to Sharp by Mrs Susan Williams, Halselbury Plucknett, Somerset in 1905. The second from Mrs Laurel Wheeler in Virginia 1918. In Sharp's Appalachian diary dated May 1st, 1918, he mentions his delight when nearly all her 13 children joined in with the singing. We can hear how the HD can also be used as a percussive instrument. Many cumulative songs pop up in both collections. Here is their version of 'Tree In The Wood' which was given to Sharp by John Vincent in Priddy 1905. Whilst at Clayhill they recorded a pod cast. Some comments from audience members and workshop participants during the week 21st - 25th May 2018. "Amanda, I had a really amazing day – my daughter loved the concert: it was a really special evening for us. I think it was a brilliant show, it had real substance and as a Somerset lad it had a real resonance for me!" "It was so great to meet Dan and Aaron, they are such gracious and generous musicians. The students were really inspired by their sessions with Aaron and can’t wait to get our dulcimers!" "The Appalachian Musicians added a new dimension to Winscombe & District U3A. It is not often that we have the opportunity to hear live music, particularly locally, and thanks to these talented musicians we were given a truly memorable evening. Mandy Boyd accompanied them on vocals for a couple of numbers and even at the end of the concert there were questions from several people who clearly would have loved more." "Good pace - time to experiment etc." "I loved it! Thank you!" "Brilliant, straight into some worldwide roots of music without too much difficulty." "Great fun, a real feeling of achievement, thank you." "I really enjoyed the workshop and was amazed to be able to play a simple tune at the end, Thank you." "Aaron was patient with us all and it was great to have the satisfaction of feeling that we actually played a tune together." "Lovely experience, love the sounds, thank you so much." "Very rewarding, we managed to play several tunes!" "Great detail, feel empowered to carry on with playing when our dulcimers arrive!" "What we have learnt today will go on to inform and enrich the music we make." ​﻿Amanda's Appalachian journey began in 2014 when she received an Artists International Development Award from Arts Council England to enabled research and performance in West Virginia. Her host was The Lincoln Theatre in Marion. Some comments made by some audience members at the Lincoln Theatre on the 27th September 2014. "Interesting history Great! Beautiful singing, talented." "Talented and gifted singers and musician. Enjoyed." "This production is unique to my experience. I appreciated the clarity of the written material too." "Lovely restoration of the theatre made for an enjoyable setting. The music was crisp and clean, excellent sound and acoustic." "I am thrilled to have seen this." "Farm scenes and children's games and clothing in film are same as SW VA in 1930s and 1940s! Very enjoyable programme. Thank you." Amanda had the pleasure of spending time with Mrs Betty Smith, a great ballad singer and the author of, 'A Singer Among Singers.' A highly acclaimed book about Jane Gentry's life and songs. By clicking on the image you will be taken straight to Betty's website. Please have a listen to the great music local musicians are making informally. Recorded at The H﻿eartwood Circle in Abingdon, Virginia, October 2014. Appalachian musician, Steve Smith graciously gave his time to impart his knowledge about hammered dulcimers and traditional banjo making techniques. Please click on the image to go straight to Steve and Ruth's website and listen to the recordings below, made at their home. Daron Douglas, Mrs Jane Gentry's great grand daughter has also given her rendition of 'The Green Bed,' which Sharp collected from Jane in 1916. With Daron's permission here is her version. Please have a listen to two tunes of 'Polly Oliver.' The first one was given to Cecil by John Barnett AKA Jack Barnard from Bridgwater in 1906 and the second was given to Cecil by Mrs Mary Sands in Allanstand, North Carolina in 1916. Whilst collecting folk songs in the Appalachians, Cecil was told that some singers in Kentucky were accompanied by an instrument called the dulcimer. He described it as being a shallow box with four round holes like a flat elongated violin. 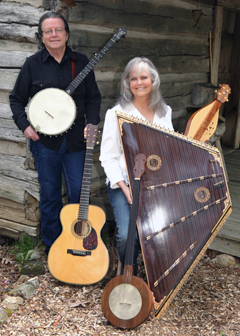 Amanda and John Shaw have been performing Somerset folk songs with the Appalachian mountain dulcimer for eight years.